Sumi is my third cat, and she joined the family by 'accident'. The husband has already put his foot down that 2 is the final number of cats we can have. For awhile after, I volunteered with the Hertfordshire Cat Protection to do home checks of potential adopters, and that's when I got involved in fostering. After convincing the husband to let me do fostering, Cammie came into our lives. 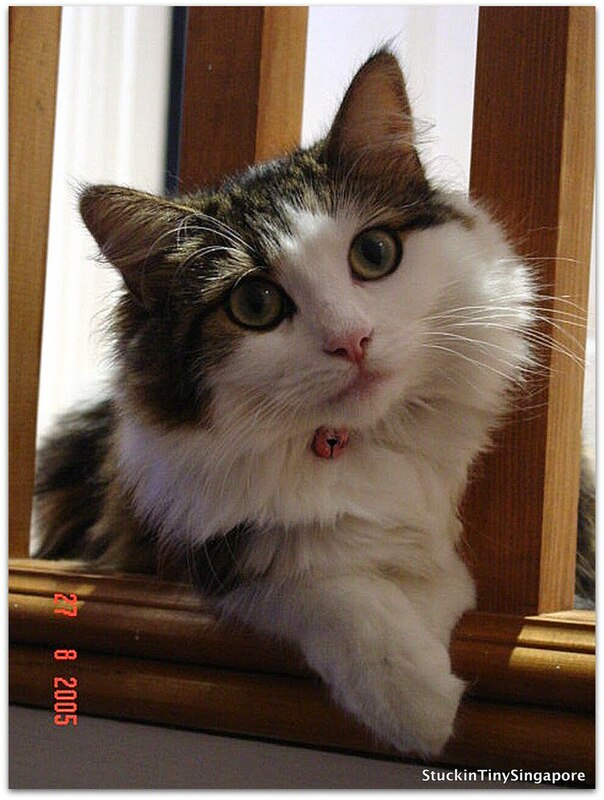 She was a cute little Tabby (my favourite colour), came from an abusive home. Apparently she had an infection on her ear flap that was left, and when rescued, they had no choice for to chop of half of her ear as the infection had gotten so bad. Cammie was very affectionate but from time to time, one would noticed her strange behaviour that indicated that she was indeed being abused or be struck by humans. She would suddenly react if you bent over her or moved your arms over her. Unfortunately, it was not peaceful on the home front. Tom and Cammie got along alright, but not Yuki and Cammie. Cammie was actually bullying Yuki. We had cat flaps installed in the kitchen door leading to the garage, which in turn had another cat flat. Yuki, being the hunter she is, goes out all the time so that she could terrorize the neighbourhood voles. However, every time, near to the timing when Yuki came home, Cammie would camped by the kitchen cat flap and swiped at Yuki the moment poked her head through the flap. It was so bad till Yuki wouldn't even dare to come home. In the end, after 2 months, we decided to call the rescue organisation to look for a new fosterer for Cammie and also the suggestion that she should be in a single cat household. Long story short, Cammie left, I was in flood of tears, the husband got soft hearted and said I could get another cat to soothe the pain!!! That was when Sumi joined us. I remembered the day we went to pick her. A colleague came with me and on the way home which was almost an hour car ride, Sumi was squirming all over his arms. She was a cutie and a beauty. One could tell from the beginning, she has semi-long hair and huge innocent marble eyes which could melt even the non cat lover. It has been proven with a few of my relatives who met her and fell head over heels over her. As in a previous post where I wrote about how much my pets love to lie upside down, Sumi is the Queen of that. She loves nothing more than lie on her back and watch the world go back. When she looks so adorable on her back, it's very difficult to resist not to give her a tickle. 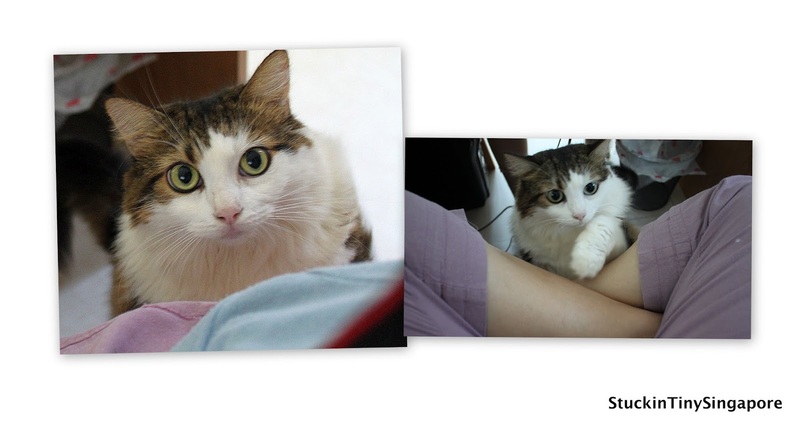 Sumi is the most 'manja' or affectionate of the 3 cats. She loves cuddles and will come looking for you for that. She is a little fatty as she is always caught stealing food. She now weighs a heavy 6kg!! and I am at my wits end of how to get her to loose some weight. When you try to play with her with toys, she flips on her back and plays!! She looks like a tabby coloured Garfield, or a fluff ball. She has also short cute legs, yet she loves to sit like a lady with her front paws crossed. She is turning 8 this year but still act and looks like a kitten. She loves to do stealth attack on either Tom or Yuki when they walk past her. Her love is boxes or plastic bags. If there is one lying around and open, you will find her in it a few minutes later. Hi mummy, can I get up on your lap please? Like the others, I hope she has a long long and happy life ahead with the family - my little fluff ball - Muacks!!! Sumi's really chubby!!!! 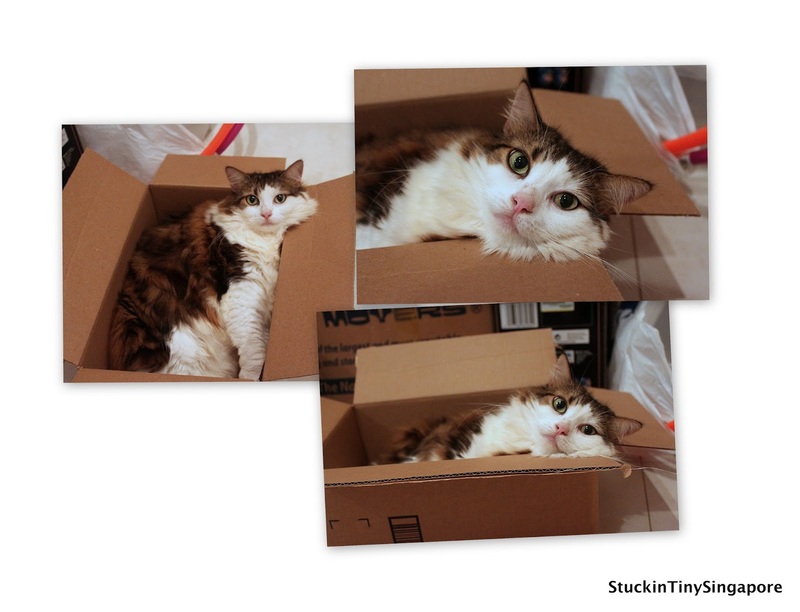 I love it, especially the poses... Sumi actually looks like our cat, Alden. I wonder if they have similar breeds. Hmm. I actually don't know Alden's. Thanks Leighlie. I love Sumi coz she is like a rug around the house. Loves lying on her back and staring at us with her big eyes!! I would love to meet Alden!! I think they are just moggies? But I don't care coz I love her to bits! !